For a truly traditional look, nothing beats the charm and elegance of real wood. 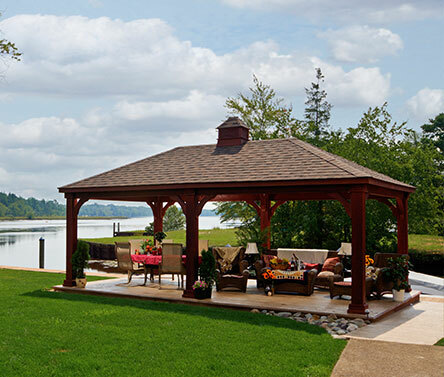 Our wood pavilions are constructed using hand-selected #1 grade treated southern yellow pine for the best possible appearance. Standard 5x5 posts with a decorative skirt, engineered 3-ply, 2x8 headers and a roof with double main rafters, create a strong structure that will stand the test of time. Hand-crafted Traditional Wood pavilion measures 10' by 14'. Craftsmanship and materials are backed by a ten year limited warranty. Each pavilion is hand-crafted in the United States by expert Amish woodworkers and finished to order with your choice of stain or paint color, roof shingles and other custom options. Pavilions are delivered in kit form unless "set up with crew" or "assembled delivery" is ordered at an additional cost. Please contact us for additional information on these options. 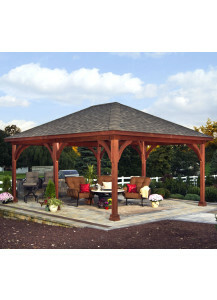 Stop by our Red Hook, NY location to see our display model 12' x 16' Traditional Wood Pavilion and look at choices for stain colors, paint colors, roof shingles and other options. Model shown in photo measures 16' by 20' and is shown with optional Canyon Brown stain. Hand-crafted Traditional Wood pavilion measures 10' by 16'. Craftsmanship and materials are backed by a ten year limited warranty. Each pavilion is hand-crafted in the United States by expert Amish woodworkers and finished to order with your choice of stain or paint color, roof shingles and other custom options. Pavilions are delivered in kit form unless "set up with crew" or "assembled delivery" is ordered at an additional cost. Please contact us for additional information on these options. Hand-crafted Traditional Wood pavilion measures 12' by 16'. Craftsmanship and materials are backed by a ten year limited warranty. Each pavilion is hand-crafted in the United States by expert Amish woodworkers and finished to order with your choice of stain or paint color, roof shingles and other custom options. Pavilions are delivered in kit form unless "set up with crew" or "assembled delivery" is ordered at an additional cost. Please contact us for additional information on these options. Hand-crafted Traditional Wood pavilion measures 14' by 16'. Craftsmanship and materials are backed by a ten year limited warranty. Each pavilion is hand-crafted in the United States by expert Amish woodworkers and finished to order with your choice of stain or paint color, roof shingles and other custom options. Pavilions are delivered in kit form unless "set up with crew" or "assembled delivery" is ordered at an additional cost. Please contact us for additional information on these options. Hand-crafted Traditional Wood pavilion measures 14' by 18'. Craftsmanship and materials are backed by a ten year limited warranty. Each pavilion is hand-crafted in the United States by expert Amish woodworkers and finished to order with your choice of stain or paint color, roof shingles and other custom options. Pavilions are delivered in kit form unless "set up with crew" or "assembled delivery" is ordered at an additional cost. Please contact us for additional information on these options. Hand-crafted Traditional Wood pavilion measures 12' by 20'. Craftsmanship and materials are backed by a ten year limited warranty. Each pavilion is hand-crafted in the United States by expert Amish woodworkers and finished to order with your choice of stain or paint color, roof shingles and other custom options. Pavilions are delivered in kit form unless "set up with crew" or "assembled delivery" is ordered at an additional cost. Please contact us for additional information on these options. Hand-crafted Traditional Wood pavilion measures 12' by 24'. Craftsmanship and materials are backed by a ten year limited warranty. Each pavilion is hand-crafted in the United States by expert Amish woodworkers and finished to order with your choice of stain or paint color, roof shingles and other custom options. Pavilions are delivered in kit form unless "set up with crew" or "assembled delivery" is ordered at an additional cost. Please contact us for additional information on these options. Hand-crafted Traditional Wood pavilion measures 16' by 20'. Craftsmanship and materials are backed by a ten year limited warranty. Each pavilion is hand-crafted in the United States by expert Amish woodworkers and finished to order with your choice of stain or paint color, roof shingles and other custom options. Pavilions are delivered in kit form unless "set up with crew" or "assembled delivery" is ordered at an additional cost. Please contact us for additional information on these options. Hand-crafted Traditional Wood pavilion measures 20' by 24'. Craftsmanship and materials are backed by a ten year limited warranty. Each pavilion is hand-crafted in the United States by expert Amish woodworkers and finished to order with your choice of stain or paint color, roof shingles and other custom options. Pavilions are delivered in kit form unless "set up with crew" or "assembled delivery" is ordered at an additional cost. Please contact us for additional information on these options.